When a susceptible variety is grown and weather conditions are very favourable, farmers may be concerned about early season leaf disease development. Rather than applying a fungicide with their herbicides, one option might be to look at a seed treatment and use xylem-mobile fungicides that will move from the seed up into the leaf tissue to provide some early season leaf protection. These fungicides are mixed with other fungicides that give us good activity on some of the root rots, whether it’s Fusarium or Rhizoctonia or Pythium and so on. Ideally, one may want to use a seed treatment with different active ingredients versus foliar fungicides that may be used later on in the season, with one application of a triazole to give us some suppression of FHB and late-season leaf disease management. Using a seed treatment for early season leaf disease management is food for thought and may be a strategy to consider. The nature of the fungicide also plays an important role in effectiveness. Some fungicides do very well in terms of particular plant pathogen groups versus other fungicides, so check the provincial crop protection guides to make sure you are choosing the right fungicide for the disease issues you are targeting. The nature of the fungicide also influences the risk of fungicide resistance. Fungicides with a very specific individual target (single site activity) within the pathogen are typically at higher risk versus actives that have multiple targets (multi-site activity). Mobility within the plant also plays a role, as it influences the efficacy, persistence and period of activity. Mobility also influences application technology, so if the product is not systemic, it will be especially critical to use practices that ensure good coverage of the plant surface you are trying to protect. Fungicide application timing is important for cereal leaf spot management. 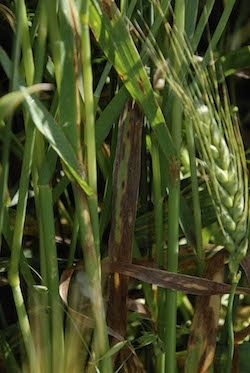 From 2010 to 2012, we looked at the effect of fungicide timing on leaf spot diseases in barley at 13 sites. Specifically, we compared tank-mixing a fungicide with herbicide versus putting that fungicide on at the flag-leaf stage versus using a split application, a half rate earlier on and then coming in with either a half rate or a full rate of fungicide at flag-leaf emergence. Overall, our results indicated the best leaf disease control and the highest yields were achieved where we put a fungicide on at the flag-leaf stage and where we did not delay the herbicide application and, thus, had early weed removal. Turkington et al. 2015. The impact of fungicide and herbicide timing on foliar disease severity, and barley productivity and quality. Can. J. Plant Sci. 95: 525–537. Another trial, led by Kutcher and Brian Beres with Agriculture and Agri-Food Canada in Lethbridge, Atla., and conducted in Lacombe, Alta., illustrated the importance of fungicide application timing for stripe rust control in winter wheat. The most effective application for AC Bellatrix, a susceptible variety, was in the spring at the flag-leaf stage. For Radiant, a variety with some resistance, there was no need for a fungicide. As mentioned previously, seed treatments may be an option for early- to mid-season leaf disease management. Recently, we did a set of experiments – including at Melfort – looking at the interaction of variety, seed treatment and fungicide on net blotch on barley. In 2013, we simply used a seed treatment without a fungicide and reduced the level of disease to less than 10 per cent of the leaf area affected from 30 per cent in the untreated control. If you looked at Twinline foliar fungicide applied with no seed treatment, there was very good control. Where we combined seed treatment with foliar treatment, it really didn’t improve control. Our best yield response was where we simply put Twinline on at the flag-leaf emergence stage, whether a seed treatment was used or not. Overall, if you look at work done by research groups across Western Canada, if you have the opportunity to choose a variety that has good levels of resistance to the disease spectrum you’re dealing with, that’s an excellent tool to manage disease and will help you to avoid a fungicide application. However, the varieties you want grow may not have a complete package of resistance to the diseases of concern. Thus, it will be important to scout fields at or just prior to flag-leaf emergence to assess disease risk and its potential impact to determine if a foliar fungicide application is required to protect key upper plant canopy tissues. Currently the recommendation for FHB fungicide application is to spray when you’ve got 75 per cent of the heads out of the boot – that’s when you can start – to about when you have 50 per cent of the head showing anthers in the middle part of that head. The problem with starting at 75 per cent head emergence is that 25 per cent of the heads are still in the boot. Thus, given the nature of the fungicides that we use for FHB, applications at 75 per cent head emergence will not provide much, if any, benefit for those heads not yet emerged. Recent research from the United States suggests we may have a wider window for application post head emergence to get the most out of that fungicide application. Trials from the U.S. looked at fungicide timing and effect on FHB disease rating and DON content with applications at the start of anthesis (when you first see yellow anthers emerging from the middle part of the wheat head) and then either two, four or six days following the start of anthesis. Overall, results suggested that even at four and six days after anthesis, control was as good as applications at anthesis, and in some cases may actually be slightly better. The trend was similar with DON content. I think, in terms of getting the most out of our fungicide application for FHB, we need to look at revising our target. Maybe going a little later is something to consider so you provide protection for all heads within the crop. However, growers are cautioned that they need to follow label recommendations and the pre-harvest intervals for the products they use. In terms of expectations for fungicides, it’s important to be realistic. Fungicides can certainly be effective tools for some diseases, but it’s important to use them prudently and to manage those fungicides so they remain effective tools for you over the next 10, 15, 20 years. Timing can have a huge impact. Fungicide application also doesn’t mean a completely disease-free crop and, thus, it is important to leave some check strips so that you can adequately judge fungicide performance. Overall, farmers are encouraged not to rely exclusively on fungicides as their only defence against plant disease. Try to use the other tools in the toolbox. The more tools you have, the broader your ability to control disease and other pest and crop management issues in your crop. By using a range of tools, including crop rotations of at least two years between host crops, you’re going to prolong the effectiveness of tools such as disease resistance and fungicides into the future. This article is a summary of the presentation “Getting the Most Out of Your Cereal Fungicide: A Western Canadian Perspective,” delivered by Dr. Kelly Turkington, Agriculture and Agri-Food Canada, Lacombe, Alta., at the Field Crop Disease Summit, Feb. 21-22, 2017. Click here to download the full presentation. Using a resistant variety will reduce the need for a fungicide.